Item number 1472/5 from the MOA: University of British Columbia. 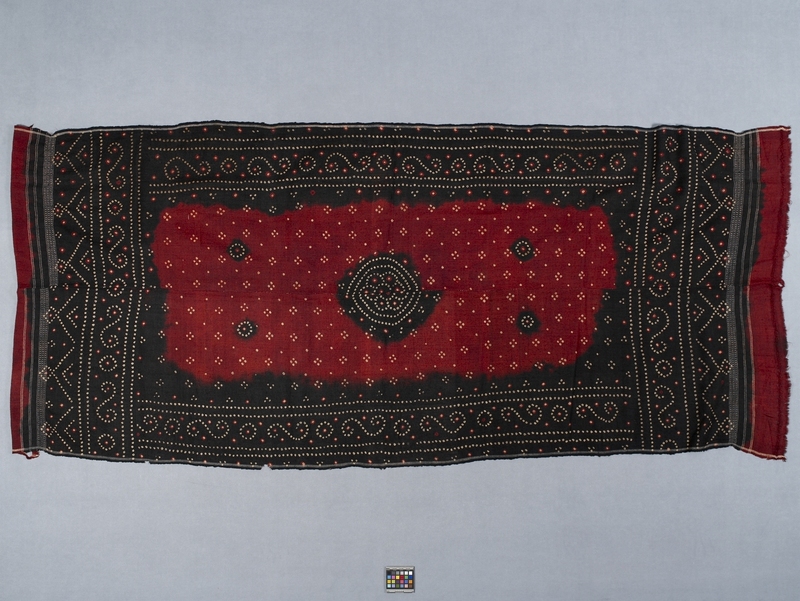 Rectangular, tie-dyed, dark red and black goat wool textile, decorated with off-white tie-dyed dots. The red central field has a large black circle in the center and four smaller black circles. There are diamond-shaped clusters of white tie-dyed dots scattered throughout. There are black borders on all sides, embellished with rows of red and white linear and curvilinear designs formed by tie-dyed dots. The textile is constructed from two nearly-identical panels that are seamed together vertically down the center, using a running stitch sewn with white thread. Woven gray-beige selvages are on the vertical edges, and there are woven cotton horizontal supplemental stripes at each end. A strip of black woven cotton textile (7.1 cm wide) is sewn at one end. A tie-dyed goat hair odhni is made in three stages. The textile is hand woven; next it is tie-dyed; finally it is embroidered. 1472/5 has undergone only the first two stages. A Rabari bride is given an odhni, a shawl worn by Rabari women, as part of her dowry. She never parts with it and wears it until it is torn. An odhni is expensive and takes from one to two years to make. First the bride’s father travels, usually by foot, to a village where he orders the textile from a weaver; months later, he picks it up and takes it to a Khatri printer for printing and tie-dying; when it is ready, he delivers it to another village where it will be embroidered. It takes a woman a year to complete the designs. Work on an odhni usually begins when a girl is very young. 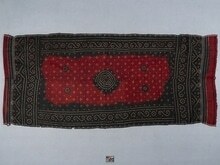 One published source says that a girl embroiders the odhni for her own wedding (Colours of the Indus, p. 28). Razia Ahmed purchased this textile from a dealer in Mithi. Bandhani means “to tie.” Before dyeing, the textile is printed with the design using a wooden block and a temporary dye that washes out. A continuous string, which has been dipped in wax, is used to firmly tie all the pattern elements on the piece before dyeing. After dyeing and washing, the string is removed.